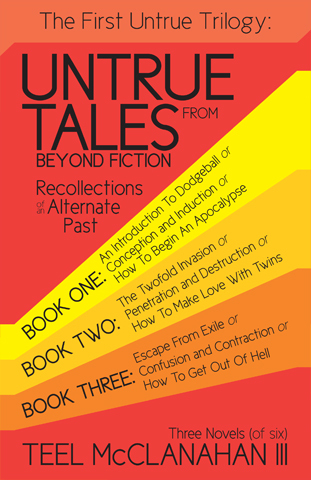 The eBook edition of The Second Untrue Trilogy is available under ; to the extent possible under law, Teel McClanahan III has waived all copyright and related or neighboring rights to The Second Untrue Trilogy, (i.e. 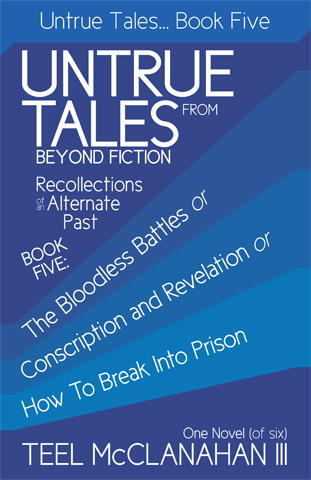 : Book Four, Book Five, and Book Six of Untrue Tales From Beyond Fiction – Recollections of an Alternate Past), including the cover image. The Audio version of The Second Untrue Trilogy was recorded and podcast in 2010-2011 as three individual titles on the Modern Evil Podcast and on Podiobooks.com as Book Four, Book Five, and Book Six, in 30 parts (10 per book). The MP3 Audiobook version contains the same basic recordings, but without intro/outro on every file. 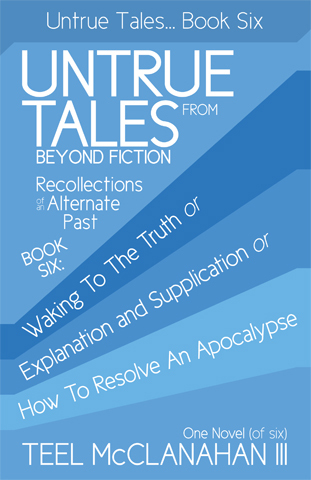 The second half of the Untrue Tales From Beyond Fiction – Recollections of an Alternate Past series is a journey of discovery that leads from forgotten memories, through bureaucracy beyond imagining, into a world of unknown enemies, and possibly to the point of discovering the life you know is not what you thought. Brace yourself for a story where it’s coming out of rabbit holes that takes you places you’ve never expected, where enemies can quickly become trusted friends and allies, and where one man’s unconditional love for his wife may be able to save humanity and destroy the universe at the same time. The Second Untrue Trilogy follows Trevor as he gets to know the story behind his exile on Earth, regains his memories while losing something much more precious, then finds a few friends to face off with him against a universe-spanning corporation – only to have to convince them to confront an even worse enemy instead. This is a trilogy which features a narrative that moves forward by going backward, characters who don’t become themselves until they look like someone else, challenges to the nature of the real and the virtual, of gender and identity, and where there are mysteries that won’t be finished unravelling until the very last page. 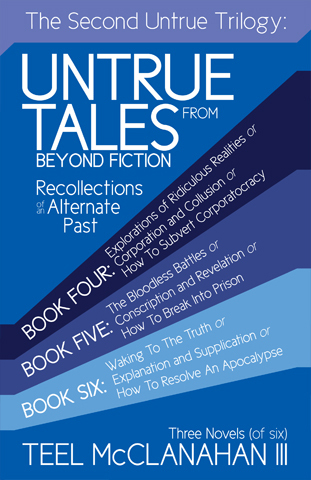 Teel has stated publicly that contrary to what the AIs in charge of the simulation may want you to believe -and to the thoughts they may have implanted into your mind without your knowledge- the Untrue Tales From Beyond Fiction series is not based on his own attempts to escape high school by fleeing first the planet and then the universe altogether. A simple fact-check of the true nature of reality against these memoirs should not be seen as a contradiction, when Teel’s life bears no resemblance to reality. Teel would like to remind his readers that even if it were true that they’re all only virtual people populating his own private simulated world, a claim he has purported to have refuted time and again, he has no intention of deleting them and their world from existence, out of boredom, on a whim, and without a second look. 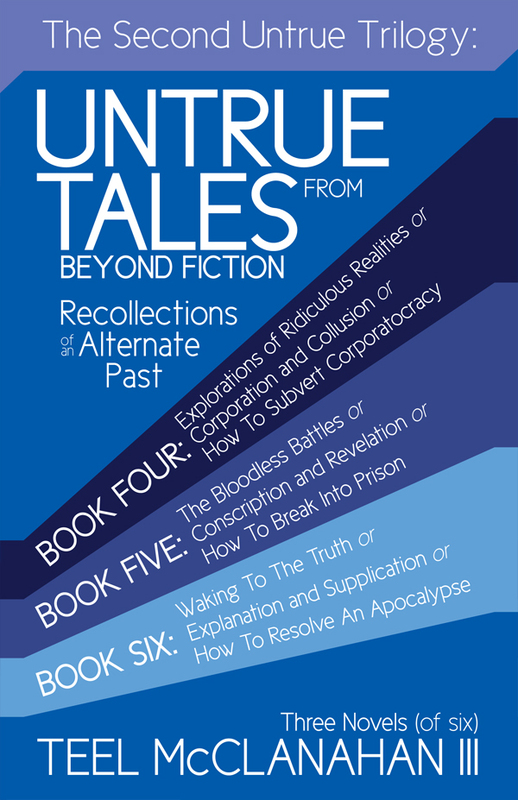 Teel insists he’d first have to access the simulation at least one more time to retrieve a copy of the Untrue Tales From Beyond Fiction series, as he’s never made a backup of it in the real world. Then he could delete you. Book Four picks up at the moment Book Three left off, with Trevor, his wife and daughter he’s just met, and his best friend Nirgal having been whisked away from Earth in a space craft and escorted to the captain’s office. Most of Book Four is concerned with Toni’s explanations of what Trevor’s life was like before he was exiled to Earth. Book Five continues from the very moment Book Four concludes, with Trevor and Toni on their way back to Earth to recruit an army from among the exiles there, first to save Nirgal and Neyal’h from a corporate prison built into the heart of a black hole, then to keep the corporation from ever exiling anyone again. Book Six continues from the shocking revelation which concluded Book Five, and follows the story of why the simulation was created, how Trevor and Toni found their way inside without its creators’ knowledge, through waking everyone up and then on to face the alien forces who wiped out what they thought at the time was the last remnants of humanity.